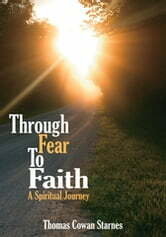 Through Fear to Faith tracks the authors faith journey from growing up years in a fundamentalist church, graduating from that churchs college and seminary, and then making the painful decision to leave that church which had saved not only his drunken father, but their dysfunctional family as well. Since success rates for so called geographical cures arent all that high, just becoming a Methodist minister didnt satisfy all his hearts needs. Finding a faith of his own one that he could preach with integrity took years of struggle; struggle that led him to therapists offices and into Alcoholics Anonymous meetings in church basements. Through Fear to Faith is, largely, a paean to the church its music, its rituals, its traditions and a promise that there is a faith to be found, if, with all our hearts, we truly seek it.